Some of you may have guessed by now, Daniel and I are doing a very thorough cleaning of the house. This prompted me to think about our home remedies of cleaning supplies we use. Don’t worry though, I’m not going to turn my blog into a cleaning idea blog. My goal is to share some of my tips that help me save money and are extremely effective. We have one cat that would prefer not to use the box. Honestly, it is extremely frustrating as we all know cat urine odour sticks around. What is causing the order is the bacteria. We tried chemicals but you know what, we go through too much of it and it seems to come back. So our secret recipe is using Mouthwash as it kills the bacteria, germs and your house can smell minty fresh at the end. Add to a spray bottle and shake. You have an instant pet odour remover. Suggestion though, you may want to choose mouthwash that is clear. The dye from the coloured mouthwashes might stain. For carpets & furniture, be sure to do a test swatch first to ensure it won’t stain or ruin your fabrics. We have been using this on ceramic tile floors and also plywood floors that are in our basement. Luckily for us, our cat hasn’t messed on our good wood floors. I would do a test sample before attempting that on our floors to ensure the Listerine / Scope and water will not damage the surface. We go through a lot of this formula. If a bottle of Listerine is about $5. It will divide 4 times for a formula. Essentially, you have pet odour remover for $1.25 per bottle! This entry was posted in Advice & Tips and tagged Odor, Pet, Shopping, Spray bottle. Bookmark the permalink. Can’t wait to try this, as we’ve tried just about everything else. 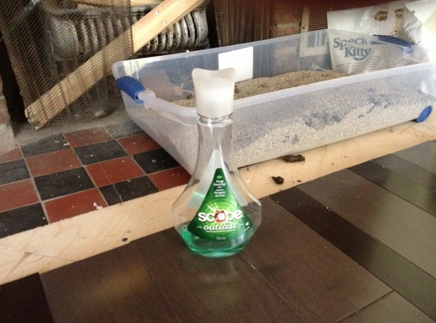 I’ve tried the awesome cleaner mentioned above,and have not had success with permanent removal of cat odors. Enzyme based cleaners seem to work the best, but Listerine works as a home remedy for a number of other things, so I can’t believe I haven’t thought of it before. Thanks Mikey! ps. for things that can go in the washing machine, I’ve recently discovered Prowash Activewear 2x liquid detergent, (designed to wash sweaty sports clothes, etc.) and it works better than anything I’ve ever used for cat urine odors. I guess everyone knows that this inappropriate peeing can be a sign of a urinary tract infection, right? Your cat might be in a lot of pain . . . Thanks for the tip. I have a large, 12 year-old female that uses the box for “solids”, but prefers to pee under my dining room table. I will definitely be trying this. I have a question t those with cat & litter box troubles, has the cat been de-clawed? If so u need to get a VERY fine litter. The coarse litter hurt their paws that’s one reason for them to go elsewhere. May I ask what your cat to litter box ratio is? Get a black light and shine it over surfaces to reveal where cats/dogs have eliminated. A black light is available in a small, inexpensive size. Only enzymatic cleaner will remove the pheromone smell that an animal can, but you cannot detect. Great idea. I will give it a try. I have been using a drizzle of Harpic lime scale remover that I use for the toilet and swishing it around the litter tray. Wait until you see the white bubbles disappear, then add really warm water and leave to stand for an hour. Terrific. hmmmm wonder how it would freshen yarn that’s been sitting a long time? If it’s clear mouthwash, it wouldn’t stain it, right? Thanks for this — I have one male rogue cat (neutered) who seems to like to go in the corner of my livingroom. I am going to be trying this ASAP! I used to use Zero Odor but it’s expensive. Then I tried vinegar. That works too but not quite as well as mouthwash. I’ve been using mouthwash for a couple of years now. No more stinky dog foot odor. For accidents, just pour on the spot, rub it in with a broom and lay newspaper over it to soak it up. Do you think it would work on Dog odors as well? I have a little “old man” that marks at times. I’ll have to try this in my basement. Had 3 cats 2 years ago and I can still smell them! Thank you for this idea. I am going to try it. I have a one year old yorkiepoo that I can not get housebroke, so I need something. I pick up a lot of tips watching the show My Cat From Hell on Animal Planet. It seems my cat has to have the litter box cleaned every day or she will find a corner in the house. I also changed the brand of cat litter I was using. Those are two tips I picked up watching the show and it has helped. Thanks for the Scope tip! Thank you, I’m going to try this. I also have a cat that prefers not to use the box. My carpets are ruined but I can’t afford to replace them right now, so at least I can try to get rid of the odor. I must give this a try! My neutered “gentleman” cat sometimes forgets his manners and spray-marks a territory. This is the reason all my yarn is in plastic see-through containers. Thanks, Mikey! Thank you! I have two cats that like a certain corner of our gym room!